As of now, the phosphate-bonded shock heat precision investment material VarseoVest P, especially developed for 3D printed partial denture frames, is available with a new formula. Users profit from even smoother surfaces of the cast objects, a lower dust formation during processing as well as improved flow properties. With the BEGO Varseo 3D printing system dental laboratories get access to the lab-production of a wide range of indications made from resins. The investment material VarseoVest P has especially been developed for casting 3D printed partial denture frames made from VarseoWax CAD/Cast and assures, due to its development, better casting results with its improved formula. VarseoVest P creates an excellent fit and smooth surfaces of the cast objects – after each casting and even with pressureless investing. Characterized by its low dust development during processing, the new investment material is contributing to a significant reduction of harmful quartz and cristobalite dusts in everyday laboratory use. The outstanding flow properties secure easy investment – even on slender object details. Additionally, the working time of about 5 minutes enables fatigue-free processing of the phosphate-bonded investment material. Only 20 minutes after investing, the mould can be directly inserted into the furnace, which is preheated to 850 to 950°C. This represents a reduced time of the heating process compared to conventional heated materials. The impressive strength of the investment material ensures that the moulds do not crack or tear as a result of the expanding plastic, guaranteeing reliable further processing. Despite its strength, easy deflaking of the cast object is possible, which leads to an economic use of blasting materials. The unambiguous expansion control with the special mixing liquid BegoSol®HE ensures reproducible fit results. The liquid can also be used with other BEGO investment materials. VarseoVest P is now available in 250- and 300-gram bags. This makes an even finer adjustment of the required powder quantity to the size of the used investment ring possible. Are you curious? For a successful entry in partial denture technique via 3D printing, BEGO offers its laboratory customers e.g. starter sets for model casting. It includes the VarseoWax CAD/Cast resin, investment material, liquid and silicone mould former. Further information about VarseoVest P and the BEGO 3D printing system Varseo S can be found here. 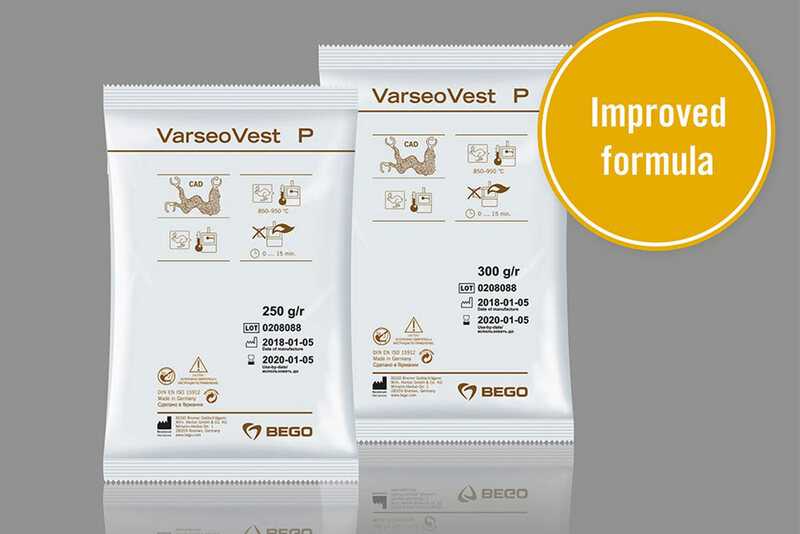 Now available with a new formula: VarseoVest P - the low-dust, phosphate-bonded, shock-heat precision investment material especially for casting 3D printed partial denture frames.